Bean Buro has designed a 1,485sqft (138sqm) apartment for a young family of four in the south side of Hong Kong Island. Unchanged since the early 1990’s, the apartment featured closed off rooms accessed by a long corridor, and large windows looking over the ocean. Retreating from Hong Kong’s busy lifestyle, the apartment’s entrance is a semi-enclosed foyer which marks the threshold between inside and outside. Designed with a comfortable seat, playful hooks and concealed shoes and coat cabinet, it allows for a moment of pause and appreciation of the home. A long slithering wooden wall connects living spaces and kitchen together, while providing plenty of concealed storages, appliances and display niches. The resulting spaces are open, airy and light – with a large feature bookshelf that appears to be floating. Daylight and ocean views are extended by strategically positioned mirrors and glass partitions, anchoring the apartment in its beautiful surroundings. The parents’ space is also flexible, with a study corner that can be softly partitioned by curtains, without compromising space or ocean views. Tranquility and retreat are sought with a fresh material palette of wood and fabric. Storages are concealed, with featured niches for displaying art, keeping the space minimal and clutter free. 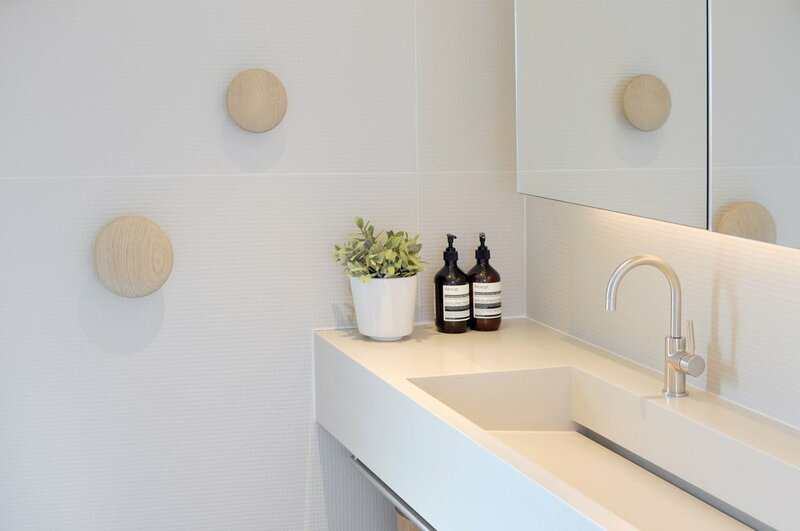 The relaxed en-suite bathroom celebrates natural materials, translucent partitions and playful accessories.